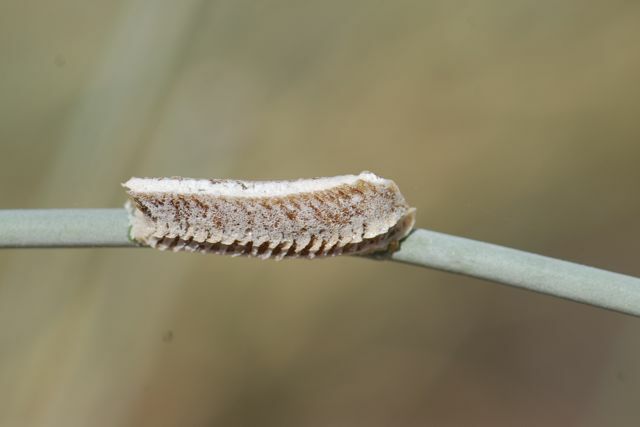 For our bug of the week last week we had a mystery: what is this? Would you believe it is a praying mantis egg case? The female mantis laid her eggs inside a frothy mass of material, which hardened into this case. 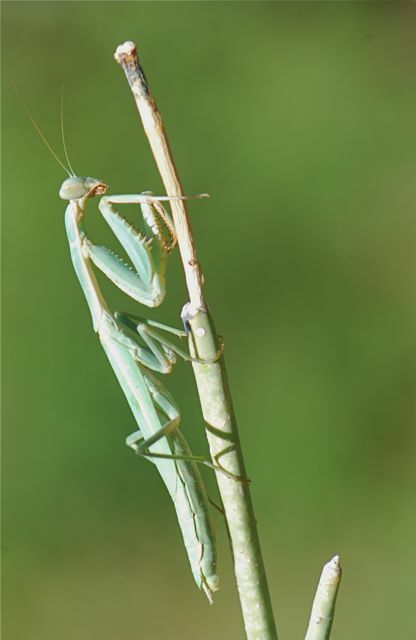 It may not look familiar to you because it is made by an introduced species, the Mediterranean mantis, Iris oratoria. It is now found in California, Arizona and other warm states. This is an interesting species because the insects tend to stay on one plant throughout much of their lives. We got to know individuals over last summer. Here is the mother of those eggs. You can tell she's a female because her wings do not reach the end of her abdomen. 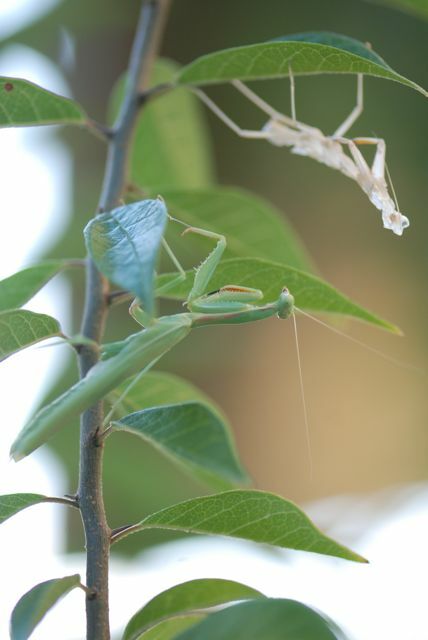 She was the "desert milkweed mantis." A male completed development on the Osage orange tree. That is his exoskeleton from when he molted. He was very pretty. See how his wings go all the way down his back? He was the only one that showed me the eye spots on the underwings that are characteristic of the species. 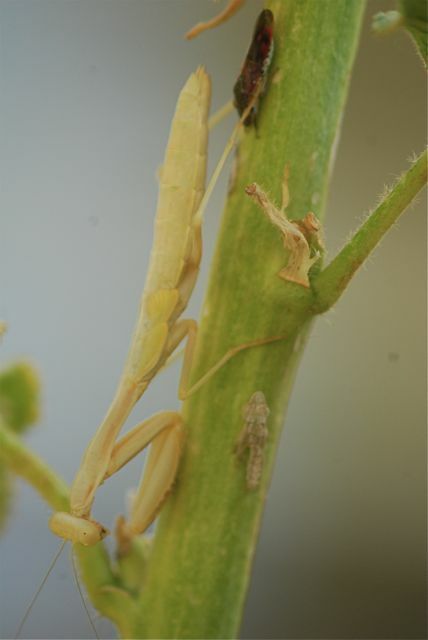 See BugGuide for a photograph of a mantis showing eyespots. I wrote a post about this beige one catching ants on my ant blog. 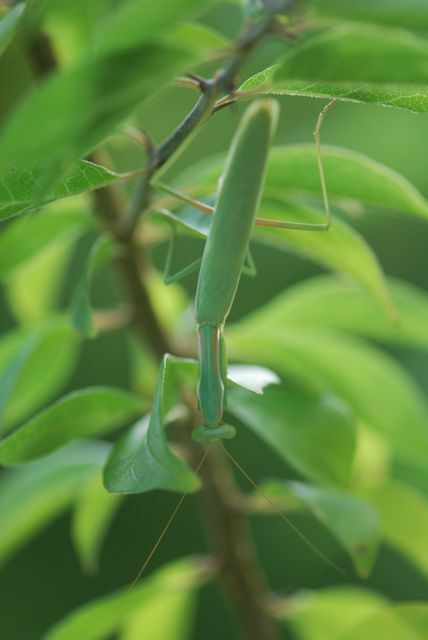 Now it is cold here and all the mantises are gone. We miss them. But with luck, the egg case will hatch into more next year. Have you ever watched a praying mantis? Thank you so much for this information. We had a lot of these in our yard, but had not found the right information on them. I appreciate you letting me know. I'd love to hear if they show up again next year. I never realized they spend their entire life on one plant! Can you imagine a single plant being your entire world? This particular species does seem to be pretty sedentary. Once they developed wings as adults, they moved around more.